Rice farmers in Borno State have called for road rehabilitation to accelerate production and ease movement of produce to markets. 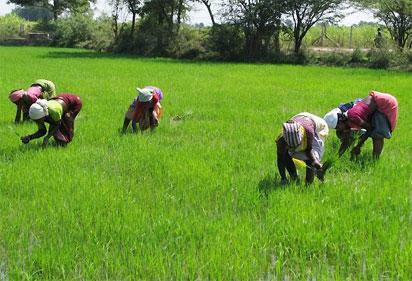 A cross section of the farmers made the call in separate interviews with newsmen, yesterday, at Zabarmari Rice Plantation in Maiduguri, the state capital. They described the deplorable state of road to the rice plantation as “inimical” to sustainable growth in food production. Malam Bello Na Bello, one of the rice farmers, said he had harvested his crops but found it difficult to evacuate same to markets. Bello added that farmers in the area relied on ox-cart to move produce to the main road and re-load it on trucks to be supplied to markets. Umaru Dan-Sokoto, another farmer, said the state of road forced him to spend too much on transportation of produce, noting that the situation exposed farmers to losses in view of the exorbitant cost of transportation. The farmer said he cultivated about 200 bags of paddy rice, but could not evacuate the produce due to poor road condition in the area. Also, Malam Hassan Muhammad, the Chairman, Rice Processors and Sellers Association, said farmers in the area produced about 150,000 tonnes of the grain during rain-fed and dry season activities. Muhammad added that the farmers needed access road to enable them to move their produce to the market. The post Borno rice farmers task govt on access road appeared first on Vanguard News.